AddFreeStats web analytic tool provides real time traffic analysis for vBulletin forum. Who is visiting your forum? what are the most popular threads? How people found your forum? AddFreeStats will answer to those questions in tracking your visitor’s behavior. With AddFreeStats, you will get more detailed traffic metrics compared to any other web analytics tool. The integration of the tool into the forum is very easy and the whole installation process should takes less than five minutes. 1)	First you need to create an account on AddFreeStats which is free, easy and straightforward. 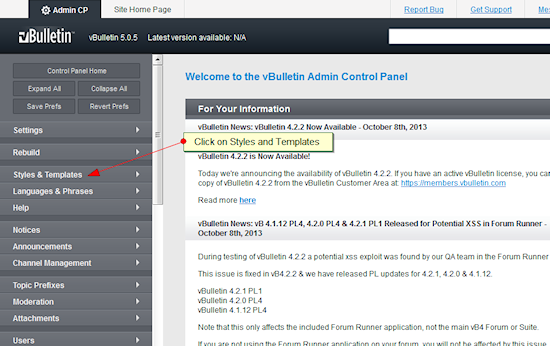 3)	Next log into the admin panel of your vBulletin board and click on "Styles & Templates". 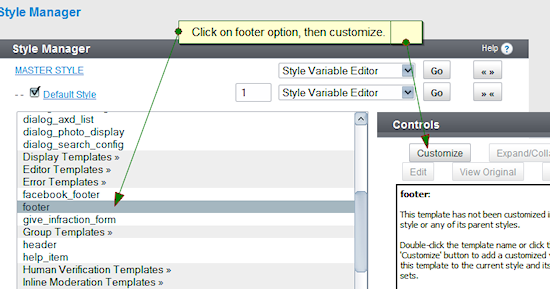 4)	Next, you should click on "Style manager" which is under the "Styles & Templates". 5)	This should open up a new platform with a drop down menu. You should select "Edit templates" from the drop down menu. 7)	You should then paste the code that you copied from your Addfreestats account. The code should be placed down below every other code on the page. 8)	Finish the installation of the Addfreestats tool by clicking on "Save" to confirm the changes. The AddFreeStats tracking code is now fully integrated to your vBulletin board and should start tracking and reporting web traffic statistics. To access the traffic analysis you can click on the AddFreeStats icon on the footer or log into your AddFreeStats account.